Bridge column, April 20: Does he have one, or two? Posted on Fri, Apr 20, 2012 : 5 a.m.
Winston Churchill said, "There are two things more difficult than making an after-dinner speech: climbing a wall that is leaning toward you and kissing a girl who is leaning away from you." There is another thing more difficult than making an after-dinner speech for many people: defending at the bridge table. Take the East cards in this deal. Your partner leads the spade jack against four hearts. How would you plan the defense? North, because of that potentially valuable club singleton, was worth a raise to 2 1/2 hearts. South might have dabbled for a slam, but the singleton in his partner's first-bid suit was a drawback. Often the less said to the defenders, the better. Note also that South's immediate jump to four hearts indicated at least a five-card suit. North might have raised with only three-card support, with, for example, a minimum 1-3-5-4 hand. If South had only four hearts, he would have jumped to three no-trump (or made another bid that was forcing). Then North, with four hearts, would have corrected back to game in that suit. Since the spade 10 is on the board, you know West has led a singleton spade or high from a doubleton -- but which? Think back to the bidding. If the lead is a singleton, South has K-Q-8-5-4 of spades. But then he would have responded one spade, not one heart. So, as you have no re-entry, you should signal encouragement with the spade nine. 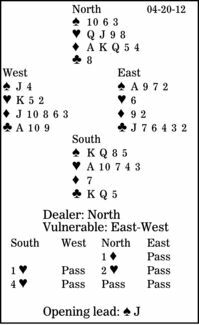 Then, when West gets in with the heart king, he leads his second spade, receives his ruff, and cashes the club ace for the fourth defensive trick.